The Land, Waters, Earth, Heavens and all Living beings are flooded with Bliss-full waves of Mighty Peace upon hearing the Holy Mother’s Power-full Divine vocals calling forth Unity and Harmony. These Sacred Songs and Prayers EmPower you to become a Triumphant instrument of Peace, armed with Sweetness and Victory-Us authority. Potent lyrics, Radiant harmonies by the Global Peace Chorus and Power Dance music will lift your Spirit and propel you to the depths of inner Peace, Joy and Strength! 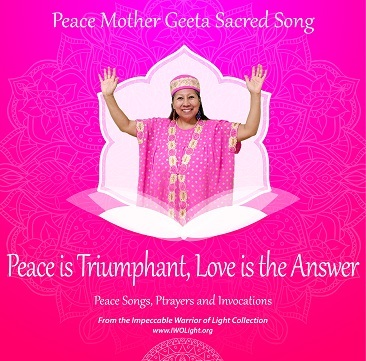 In this album, Peace Mother has gifted us Peace Songs, chants and Mantras that will be sung by Humanity for ages to come.This Sacred Album and all products from the Shaman’s store are Blessed by the Holy Mother, Peace Mother Geeta Sacred Song and therefore carry Her Shakti and Her Power-full Intentions for the Healing and Upliftment of all Humanity.